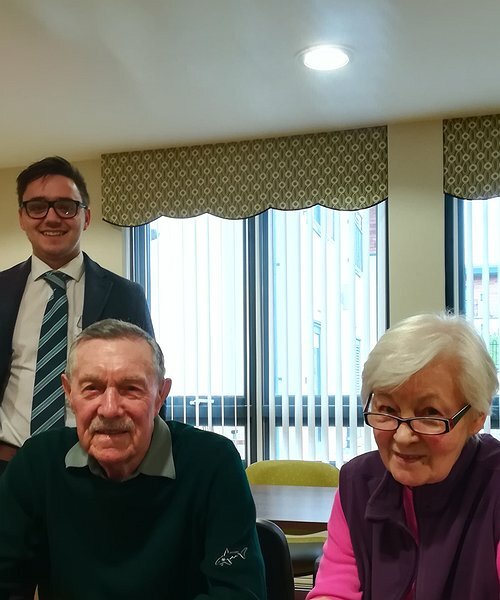 Tenants at an extra care housing scheme in Acrefair, Wrexham, have been been picking up tips on how to stay safe online as part of a workshop session presented by Barclay’s Bank ‘Digital Eagles’ Community Banking Team. The session was held last week at Plas Telford, and independent living scheme managed by Clwyd Alyn Housing Association in partnership with Wrexham County Borough Council. “The ‘Tea and Teach’ session was really appreciated by our tenants,” said Louise Blackwell, Community Development Officer for Clwyd Alyn, which is part of the Pennaf Housing Group. “Rhys Scarll, Community Adviser with the Barclays Digitial Eagles Team, offered one-to one support for tenants helping them with a wide range of technology-related queries and he also presented those attending with a helpful guide about how to avoid scams,” added Louise who thanked both Rhys from Barclays and Yvonne Jones, Extra Care Manager, for helping with arrangements for the session. "Chief Executive retires from leading housing group"
"Digital Eagles land in Abergele"